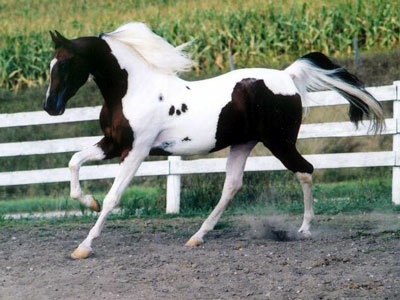 National Show Horses originated as a part-Arabian cross between an American Saddlebred and an Arabian horse. They are now established as a separate breed, since the founding of a breed registry in 1981. National Show Horses combine the refinement of Arabian Horses with the animation of Saddlebred horse. The resulting horse has the high-set, upright, long, swan-like neck of the Saddlebred. The neck should not have a pronounced crest. The head is usually refined and small, with small ears and either a straight or concave profile. The horses are close-coupled with a level topline and have a very deep, laid back shoulder. The tail carriage is high. National Show Horses may be a variety of colors, including the traditional bay, gray, chestnut, and black of the Arabian, with Saddlebred ancestry adding a broader range of color than seen in the Arabian breed, including, most notably, pinto and palomino.